Ubuntu's rise to power has been rapid, historic and well-deserved. It's the best Linux distribution ever, but most people only use a fraction of its power. Award-winning Linux author Keir Thomas gets down and dirty with Ubuntu to provide over 300 concise tips that enhance productivity, avoid annoyances, and simply get the most from Ubuntu. You'll find many unique tips here that can't be found anywhere else. You'll also get a crash course in Ubuntu's flavor of system administration. Whether you're new to Linux or an old hand, you'll find tips to make your day easier. Ubuntu builds on a solid base of Debian Linux to create an award-winning operating system that's light-years ahead of its competitors. Ubuntu consistently tops lists of the most popular Linuxes amongst professionals and enthusiasts; Dell recently embraced Ubuntu in its product lines after a user survey indicated overwhelming public support. 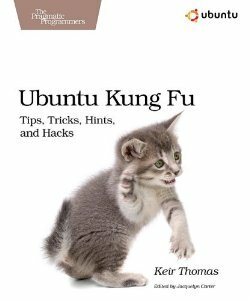 Ubuntu Kung Fu provides hints, hacks, tweaks and tricks for every level of user. Guaranteed to be free of the usual dross that fills tips books, Ubuntu Kung Fu is written to be entertaining and, above all, readable. Its 300+ concise tips utilize and exploit hidden or lesser-known features to boost day-to-day productivity. You'll also find tips on tweaking Ubuntu, wrangling the system into shape, optimizing, enhancing security, and lots more. Learn what extraordinary things can be done with Ubuntu.